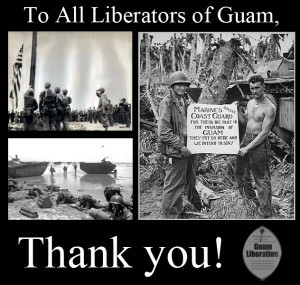 If you served in the Second World War and were part of the Liberation of Guam in 1944, we would like to honor and encourage you to attend the nearest Guam Liberation event. Click on the location of your interest in the right hand column and there will a person you can contact or feel free to email us at GuamLiberation@gmail.com. We will be more than happy to point you in the right direction. We appreciate your service and look forward to honoring you. Thank you very much!